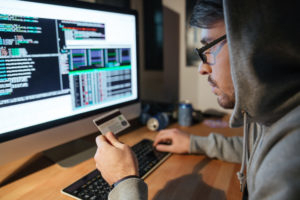 Cyber criminals are constantly trying to stay one step ahead of the good guys, and there is now another scam out there that you should know about: synthetic identity theft. Basically, the criminals take information from someone, and then make up the rest. They also often use fake Social Security numbers, called CPNs, or “credit profile numbers,” or names. This type of identity theft shows us that our credit system is more vulnerable than we might think. Basically, it is easy to create a credit file on these identities, and once they have that, they can get a credit card or loan. Of course, using a CPN like this on an application for credit card or loan is illegal, but lenders currently don’t have a conclusive way of distinguishing a real Social Security number from one of these fake ones. The Social Security Administration generates SSNs randomly. This makes it difficult for a lender to notice a fake one. Technically, a lender can contact the SSA and cross-check, but most of them don’t. Why? Because the SSA requires a handwritten signature from the person who has that SSN, and this is a pain in the neck for lenders. So, of course, the best thing to do is to create a way for lenders to instantly check to see if a Social Security number is valid or not, and as of now, they do not have the capacity to do this. Lenders do, however, use their own fraud-detection tools, but these requests for credit still fall through the cracks. This practice also has created more open windows for fraudsters, because they know that the system is vulnerable. It’s true that many lenders won’t accept a credit application from someone with no history of borrowing, which is the case with a CPN, but some still do, and the more activity the file sees, the more likely it is that credit will be given. Once credit is approved, a full credit report is created. Though it likely won’t be a high amount of credit, many lenders take a chance on new borrowers, and at a minimum, extend a couple of hundred dollars. Some people will even get a card that has, say a $300 limit, and use the card for a time. Once they establish a good payment history, they can get a credit increase, and that’s where the fun really begins. This is just one more scam that you should be aware of, and one more reason to keep your private and personal information safe. Robert Siciliano personal security and identity theft expert and speaker is the author of Identity Theft Privacy: Security Protection and Fraud Prevention: Y.... See him knock’em dead in this Security Awareness Training video.